The weather forecast was calling for 15 km/hr winds in the morning and 25 km/hr winds in the afternoon. 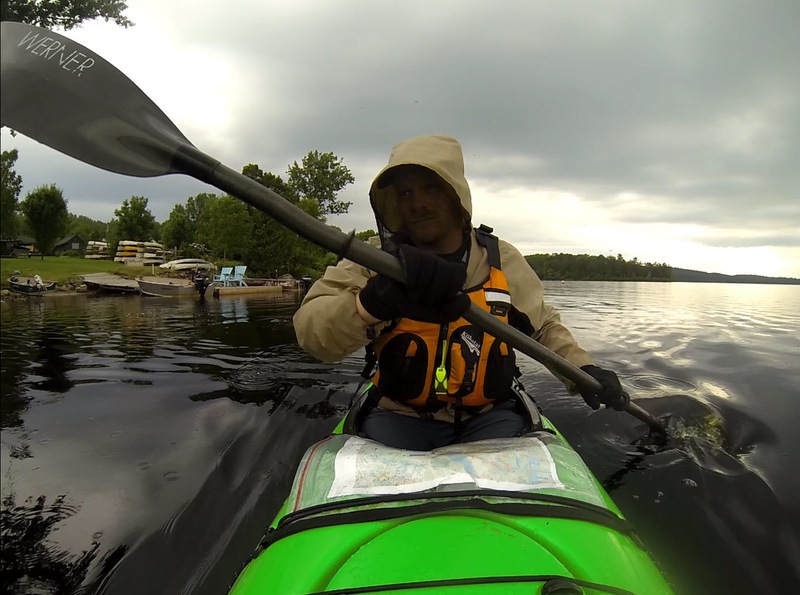 Opeongo is the biggest lake in Algonquin and can get rough on windy days, so I decided an early start was in order. Gear loaded, kayak on the roof, I left home around 5 AM, much to my wife’s chagrin (at waking up that early, not at me leaving). The drive was peaceful, the roads virtually deserted. 9:30 AM, permit attained, kayak loaded and car parked, I was ready to go! Despite it being Saturday morning there were few people around at the Opeongo put-in. A couple loaded their gear into a small motorboat and sped off. A water taxi left with a load of campers and four canoes on top, and a handful of other people were milling around, preparing for their own trips or perhaps just enjoying the beautiful morning. 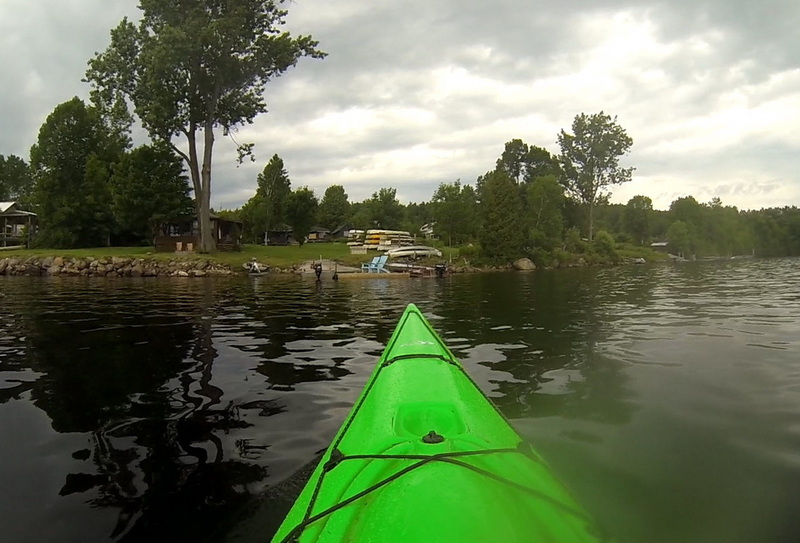 I slipped into my kayak and pushed off from the dock. I was on my way! ​As I passed Bates Island into the more open parts of the South Arm I realized the wind was a bit stronger than I thought, but it was still reasonable. Out of the Northwest, it was just enough of a crosswind to force me to put down the kayak’s rudder. My cause wasn’t helped by my insistence on filming my progress for short stretches, interrupting my momentum as I started and stopped the camera. There were very few canoes on the water, although I saw a number of campsites in use. Windy Point, and then the Western Narrows came and went. Having already used up a camera battery, I pulled up on a little dot of land next to Hershey Island. Stepping out and stretching my legs was a welcome change of pace. Often stricken with “Get-there-itis” on backcountry trips, I forced myself to stay and relax for a few minutes, enjoying the sunshine and the break from paddling. I changed GoPro batteries. I took out my digital camera and filmed a short segment for the video I’ll start working on any day now. Really, any day now. I had a snack. Finally, it was time to get back on the water. The rest of the paddle was windy but uneventful, aside from a motorboat that pulled into the bay at the Red Rock portage just as I was reaching it, as if to mock my hard work. After the long paddle I was actually looking forward to my first, and only, portage of the day. Even more, I was looking forward to seeing Red Rock for the first time. Despite beginning many trips on Opeongo I’d never been to Red Rock before. It’s not on the way to anything – either it’s your intentional destination or you have no reason to be there. Today I finally had my reason, and I couldn’t wait. As I was pulling up to the portage I was wondering: bug jacket? No bug jacket? Within moments of landing the question was answered, as there were enough mosquitoes around to give me an idea what I might expect. I tossed on the jacket to protect my arms, but left the head net down. Little did I realize at the time, but my bug jacket was to become the MVP of the trip. The portage itself wasn’t overly memorable, but I was thankful I wasn't walking it it in the opposite direction. I reached Red Rock in short order, and pushed out onto the lake. What a beauty! Changing plans, I continued to follow the shoreline to scout sites further west. As luck would have it, the mainland site south of the island was open, and was pretty nice to boot. Any site in a storm, and the wind was still gaining strength. It was around 2 PM and I was already on my campsite for the day. While I had lots of time to work with I always prefer to get my chores done first, and soon enough my tent was set up and organized, a decent stack of firewood was waiting by the firepit, and the remainder of my gear was stashed away in case the weather turned. Finally it was time to relax! The rest of the afternoon passed by in lazy Algonquin fashion. The wind was keeping all but the most determined bugs away, and I took advantage of it. Swimming, lying in the sun and a bit of book reading caused the next few hours to slide past as quickly as the clouds overhead. ​Nothing makes food taste better than hard work, and I’d put in a few solid hours that day. Burgers were my first evening meal, and soon the pair of them were sizzling on the grill. With sharp cheddar cheese and all the fixings, they were heavenly. As is so often the case when I’m camping, my day began early and ended even earlier. Not long after dinner my yawns started becoming more frequent than the lulls in between. I brushed my teeth, went for a walk into the woods to stash the bear barrel, then crawled into my tent and called it a night. The sun was still shining, but hey – it was night somewhere! One of my last thoughts before losing consciousness was: this is only day one. I have six… more… days. If I wasn’t smiling as I fell asleep, I was certainly smiling in my dreams. Day 2 was one of the more ambitious travel days on this trip, so my morning began early. On top of that, the forecast before I set out had predicted 30 km/hr winds, rain, and possible thunderstorms for the day. The morning greeted me with strong winds, but no rain (or sign of) in sight yet. The sooner I could get on the move, the happier I’d be. Breakfast was oatmeal and coffee, boiling the water over my new Bushbuddy. 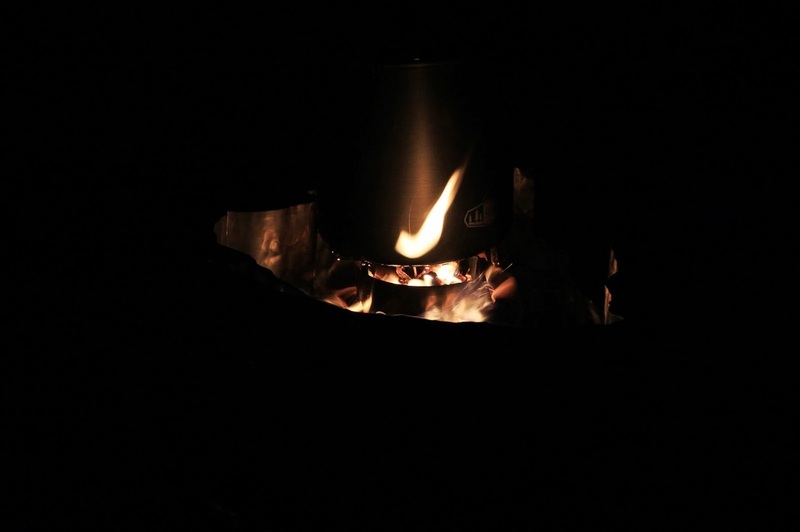 It was the only stove I’d brought on the trip, leaving my Whisperlite (and its fuel bottle) at home. This was partly to save a few ounces of weight while portaging, but also to enjoy the added challenge. With rain in the forecast, I wasn’t entirely sure dinner would be hot that evening. I was packed up and on the water by 7. While I did see some more of Red Rock on my way to the Happy Isle portage, I knew I’d have to come back some day with more time to explore. The Red Rock to Happy Isle portage was where I discovered the black flies were still around, and in very healthy numbers! The portage was very wet, very mucky, and very buggy, and I was glad to see the end of it. The first of many on this day, however, so I didn’t let it affect my spirits. Happy Isle and Welcome passed quickly. I pumped some water for the coming portages. I filmed a kayak portage start to finish between Happy Isle and Merchant (On my YouTube Channel if you're interested). I saw a single campsite in use on Happy Isle (with 6 canoes on it), none on Merchant. The Merchant to Big Trout portage, while almost 2km in length, is one of the kindest portages in the park. Nice footing, no major ups and downs, I’ve never found it anything but an enjoyable experience, and that day was no exception. Well, as enjoyable as portaging gets. 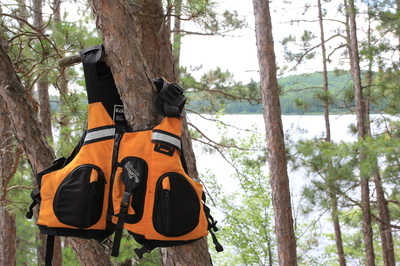 I’d been wearing my bug jacket since I left Red Rock, and while the head netting came off while out on the lakes, it was zipped up fully on all portages. The winding stream leading into Big Trout was buggy enough that I stayed fully covered until I reached open water. This section of Big Trout often acts as a wind funnel, and with strong winds out of the west today was no exception. The wind was blowing, waves were crashing over the deck of my kayak, and I was laughing like a madman, enjoying every second of it. I pulled up to the backside of the first island campsite, enjoying a few moments of shelter from the wind. I briefly considered getting out and taking a longer break, but decided I’d push farther down Big Trout before taking some time off the water. Besides, my route would take me past a favorite campsite of mine. If it was available, it would be a fantastic place to recharge. I pushed away from the island’s edge and started paddling. A few strokes ahead I could see a line in the water, where it went from calm and sheltered to windy and wavy. Big Trout’s largest island up ahead may have been sheltering me from some of the wind still, but it sure didn’t feel like it. I headed for that island, ducking behind it and out the channel on the other side as so many paddlers do. Rounding the corner out into open lake, my pit-stop destination was in sight, and it looked like nobody was on it. I wasn’t terribly surprised, having seen no canoes on the water all day and only a single campsite (two lakes behind me) in use. Pulling up to that site was like meeting up with an old friend I hadn’t seen in a while. I’d last camped there two years ago on a mid-June loop. While it was only for a single night, I had fond memories of my time there. The weather had been gorgeous, the bugs virtually nonexistent, and I’d had the lake entirely to myself. Comparing the conditions then to my current trip, I couldn’t help but laugh. But with the bugs being what they were, I found myself hoping the wind stayed as strong in the days ahead. After a brief hello to the campsite, I walked out onto its best feature: a huge chunk of glorious Canadian Shield overlooking the water. Having not ‘called home’ since I woke up early that morning, I set my SPOT on the rock beside me and pressed the buttons to send an OK home to my family. That underway, I spent some time lazing in the sun and munching on snacks. Call home complete and the edge taken off my hunger, I clambered back into the kayak and got underway. 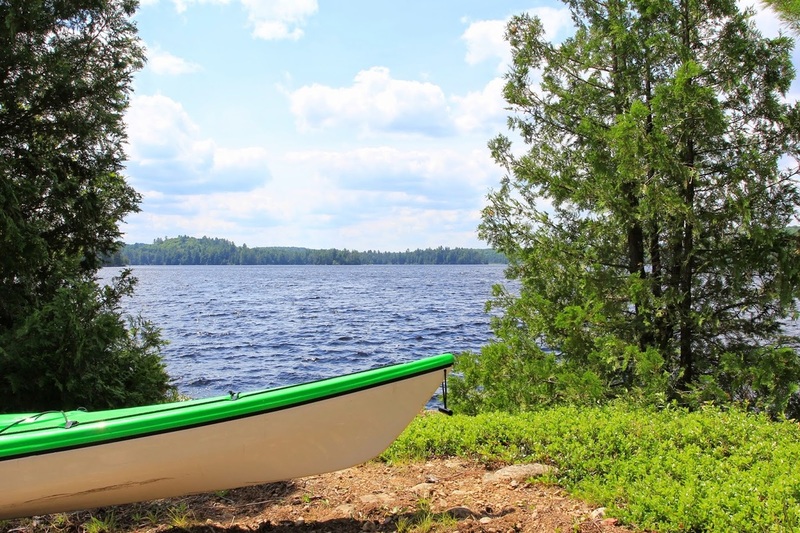 While I wasn’t feeling pressed for time, I still had quite a bit of paddling that day and was looking forward to reaching my destination.The rest of Big Trout was uneventful, as was the portage into Longer. The North/South section of Longer is a pretty mundane paddle on most occasions, but today I saw a pair of canoes in the distance! Having not spoken to anyone since pushing off the Opeongo dock the previous morning, I was looking forward to exchanging a few words, or even just a nod and hello if they were traveling the other way. It turned out to be a group of fishermen out trying their luck. We spent a few minutes chatting about the weather, the fishing, the bugs and how great it was to be in Algonquin, and then on I pressed. (Weather: windy. Fishing: no luck. Bugs: bad. Greatness scale: pretty great). Buoyed by a few minutes’ of conversation, the rest of the Longer Lake paddle passed in contented silence. After the turn towards the 40 meter portage, I saw the first (and as it turned out only) moose of the trip. A bull moose, he barely acknowledged my presence as I paddled past. For some reason I failed to take a single picture, despite the close range and his apparent indifference. Sometimes my get-there-itis gets the better of me. On one of the two short portages to follow I encountered a father with two kids (at a guess his son and the son’s friend). Brand new to Algonquin tripping and inexperienced paddlers, they’d nonetheless fought their way to this portage from Hogan’s Lake that day. “Is it always like this?” he inquired, referring to the wind and bugs. I laughed, acknowledged they’d gotten a bit unlucky, and wished them well for the remainder of their trip. Camp setup complete, a couple hours of lazing, sunning, swimming and a nip or two of rye followed. A pot of water boiled on the stove and a full stomach later, the darker clouds rolling in convinced me an early bedtime was in order. Crawling into my tent, I pulled out the kindle determined to read for a couple of hours. Instead, tired and content, I managed a couple of pages and turned in. 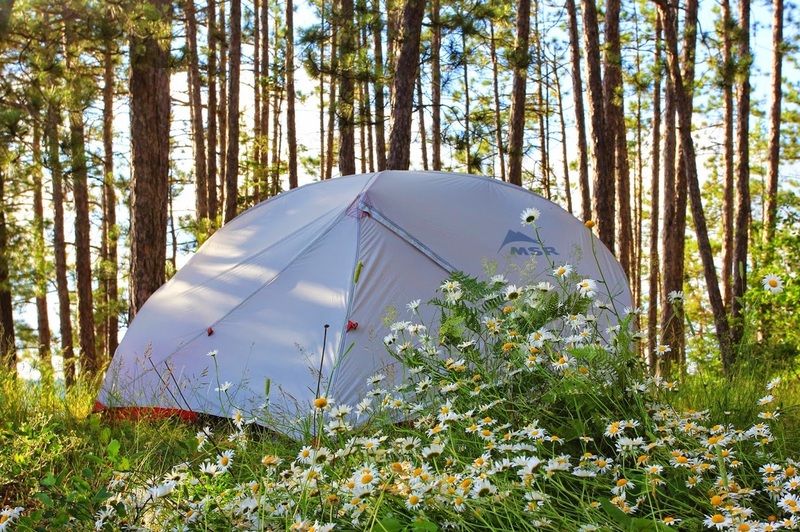 I woke up to the sound of raindrops hammering the tent fly. While my get-there-itis was suggesting I take down camp in the rain and get moving, my rational side won the battle that morning. I knew it was a shorter travel day, and so had the luxury of burrowing back into my sleeping bag to see if the weather improved. I decided I could hang out for a few hours and still have plenty of time to make Catfish that day. While I was happy to wait out the rain, breakfast couldn't wait – I was hungry! I'd set up a tarp the evening before and that morning it came in handy. After a walk through the wet brush to recover my bear barrel, I had a dry area to hang out and boil water. With a full stomach and a cup of coffee in my hand, I headed back to the tent to wait out the weather. Fortunately, the rain did eventually stop. I took down camp in a hurry, worried the still overcast skies would open up again at any moment. Not long afterwards I loaded up and pushed off from my campsite. Today was an exciting day - I was going to explore new territory! 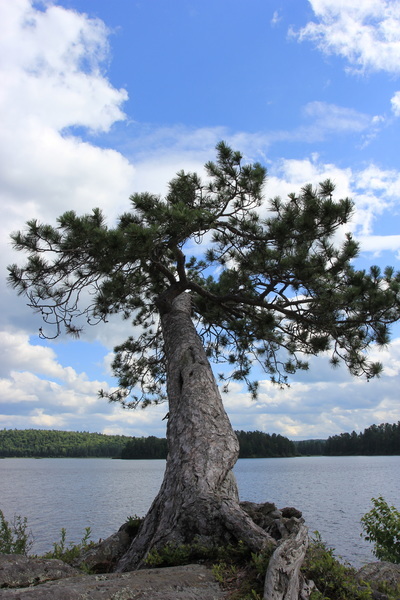 While I’d been on Red Pine Bay and its neighbour to the north, Burntroot Lake, many times, the rest of the day’s trip was to be a first for me. River travel and its inevitable series of portages is not ideal kayak country, but this route wasn’t bad: 5 portages totalling 1.4 km. With Catfish Lake as my destination, I was confident the reward would be worth it. Approaching the first portage of the day from Burntroot into Perley, I decided to quickly scout the rapids on the off chance I could run them. They looked entirely paddleable! The volume of water and force of the current, however, meant that striking a hidden rock could result in a badly damaged boat. I decided that saving ten minutes wasn’t worth the risk and returned to the portage. I stepped out onto shore and was quickly reminded that the bug jacket wasn’t optional equipment. I hastily pulled it out of a dry hatch and zipped it up. It was to remain on for the rest of the travel day. The trip down Perley and into the beginning of the Petawawa was uneventful. As I approached the next portage, 380m, and with thoughts of the last rapids still bouncing around in my head, I made a truly foolish decision. 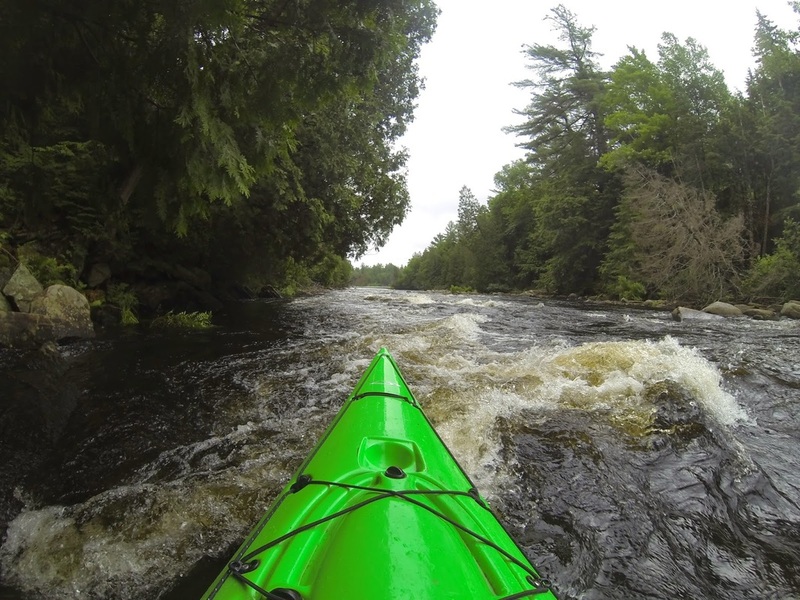 While I wasn't willing to risk running the rapids, knowing I was far from help if something went wrong, I decided to walk my kayak through them rather than take the portage. Not lining my kayak from the shore – there was no walkable shore – but literally wading down the rapids hanging onto the boat. In the end I succeeded with no major mishaps, but it took me three times longer than the portage would have as I carefully felt for footings in the current. Tired, wet and annoyed at myself for making such a poor choice, I travelled the remainder of the Petawawa in more traditional fashion, with no attempt to skip the remaining portages. At the end of the Pet I reached a split in the waterway. To the right was Sunfish Lake, which I would be passing through in a few days’ time. To the left, hidden around a few more bends, was Catfish. After a long glance to the right as if I could divine my future, I turned left and resumed paddling. Catfish Lake was as beautiful as I had hoped. It probably didn't hurt that after an entire day of overcast skies, the sun made an appearance just as the Catfish opened up before me. Open water and windy weather allowed me to take off my head netting for the first time since I left Burntroot. 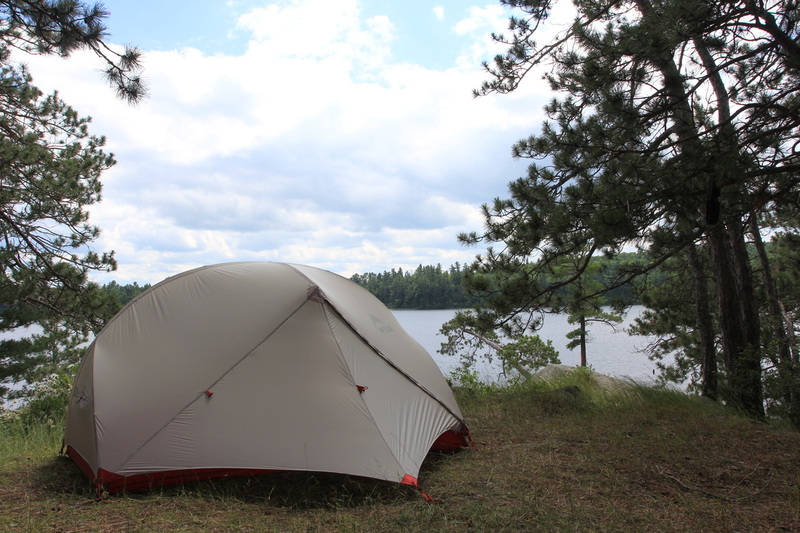 At the recommendation of a fellow Algonquin Adventures forum poster, the campsite on Shangri La Island was my hoped-for destination. While my map suggested Shangri La could be cockroach infested, I figured I’d take my chances if it was available. As I paddled closer to the island I could understand the recommendation: a massive, sloping slab of Canadian Shield, with a view of more than half the compass. And as luck would have it, it was mine for the taking! Walking from the waterline to the firepit area of Shangri La felt like an uphill portage, but knowing this was my home for the next three nights, a first for me in Algonquin, I was practically floating up with my gear. On a typical solo trip I'm on the move every day, but I was very much looking forward to putting down roots, especially with such a gorgeous campsite under me. The skies finished clearing, the wind kept the bugs at bay, and I was had a peaceful late afternoon and evening of sunning, swimming, and relaxing in paradise. Today was to be something different than my usual camping experiences: a day trip. Travel from Catfish to the Brent store, where a resupply package was awaiting me, and then come back to Shangri-La Island. 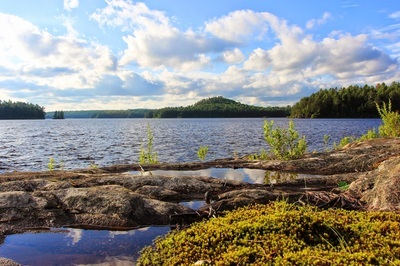 Since my camp was staying in the same place, I had a luxury I've rarely experienced on my camping trips: to travel with nothing but my kayak and the gear I need for a 'there and back again'. I'd asked for advice on this particular day trip, and many of the (experienced) campers told me it was a longer trip than they'd want to do in a single day. But I had two advantages: 1. I'm dumb and 2: I was in a kayak. Because the advice from campers I trusted had me worried I was biting off more than I could chew, I was planning to set off from Shagri-La early. Shortly before 7 AM I pushed off of Shangri-La, and started preparing for the trip ahead. It was a gorgeous morning, so for a moment I just sat in my kayak and enjoyed the silence. Shangri-La Island to the Brent store is a bit over 14 km, including 3 1/2 km of portaging. Without most of my gear I wasn't expecting the portages to be all that rough, but I was looking forward to checking out the infamous Unicorn Hill. And since it was a there and back again trip, I'd get to walk it in both directions. Catfish is a beautiful lake, and the paddle across it that morning was serene. I passed a few occupied sites, but saw no sign of movement anywhere. For the time being, at least, it seemed as if I had the lake to myself. Narrowbag Lake, despite its interesting name, was not particularly interesting. A short portage into it, a short one out, and a few paddle strokes later I was pulling up to the beginning of the 2345m portage that contained Unicorn Hill. In this direction the hill would be downhill, but I knew I'd be climbing back up within a few hours. The rest of the outward bound leg of this day trip was uneventful, except for one thing. As I neared the end of the 715m portage into Cedar, I ran into a very large group of young men (15 - 20). They had a fire going in a firepit overlooking the river, Gear was strewn everywhere. I didn't think much of it at the time - that many people means a lot of gear, after all. I nodded to a couple of them as I portaged past, but didn't notice any acknowledgement. I'll come back to this story later. 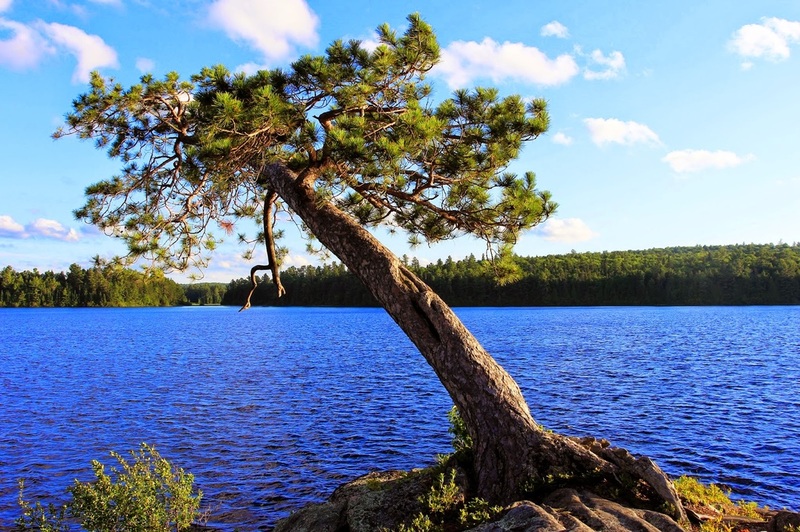 ​I was happy that my first view of Cedar Lake was by kayak, not by car. On the other side of the 'happy' spectrum, a light ran had begun to fall. My rain jacket would have come in very handy at that moment, if it weren't sitting in my tent a dozen kilometers away. I resigned myself to getting a little damp, and hoped it didn't rain any harder. I took very few pictures or videos during the rest of this day's travels. I had switched to 'get there and get home' mode. As I pulled up to the docks at Brent, two thoughts were going through my mind. The first was "I finally get to meet Jake!". The second was "I hope there's something here waiting for me". The Brent store was something to behold. More a museum than a store, I was thankful that I (hopefully) had a resupply package waiting for me, as I didn't see much I could buy. After exchanging a few words with Jake, I said "I believe you have a package for me". Not knowing if he had one resupply or 50 in the back room, I added helpfully that it was a shoe box. Moments later, the resupply was in my hands! I chatted a bit more with Jake. I bought a can of coke and drank it fast, feeling the sugar rush into my body. I bought two chocolate bars and ate one on the spot. Then it was time to move on, retracing the route I'd already travelled - although this time uphill, and with a bit more weight to carry. 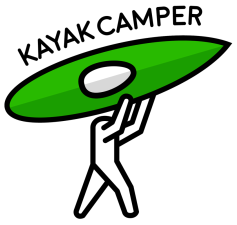 I paddled back across Cedar, and started into the first portage of the return leg. I glanced in the direction of the fire pit where the large group had had their fire going earlier. In place of the fire was a large pile of empty plastic water bottles. To say I was angry was an understatement. I was alone in the woods but started swearing, loudly. This part embarrasses me to this day: I left the water bottles there. If I'd been thinking clearly, I'd have picked them up and brought them with me, eventually carrying them back to Opeongo. But I had my kayak on my shoulders and a lot of travel left ahead of me that day, and I just kept going. If I could go back and do it over, those bottles would not have stayed there. Here's the thing: one guy in an unloaded kayak travels a whole lot faster than a group of 20 with gear, and there were no forks in the trail until Catfish. I caught up with them, spread out over the short portage into Narrowbag, and I stopped each group as I passed them to give them hell. The first two guys I spoke to denied they had anything to do with it (I had passed no-one else. There was no doubt who was responsible). The next group admitted it. Then I spoke with their 'leader', who was very apologetic. But apologies didn't stop those water bottles from (most likely) ending up in the Petawawa. What somehow makes it worse is that this was a church outing, and their leader was a priest. For some reason I expected more of them. Still really ticked off, I carried on my way. As if in punishment for not picking up those bottles, the skies opened up on me about half an hour before I reached Shangri-La. Soaked anyway, I stopped to filter water before I landed on my campsite. Tired, wet, annoyed, I was back on my site around 1:30 PM. All told not that long of a day by my standards, especially without my gear. While I hadn't had the sense to bring my own rain jacket, I'd at least left everything under cover at my campsite. I stripped down and crawled into my tent, food package in hand. This is when I finally opened my shoe box, and discovered that not only was my resupply intact, but JB had added cheese strings and home-made jerky to the stash. Suffice to say, neither of those items survived the day. Unexpected food is the best food. The rest of the day and evening passed. The rain let up, and I hung up my wet clothing to dry. I swam, I ate, I drank, and I looked forward to tomorrow - the "do as little as possible" day. Here was the plan for the day: Eat. Drink. Repeat. As enjoyable as this day was, it makes for a pretty dull trip report when I never left the campsite except to pump water. Suffice to say I ate, I drank, I swam and I repeated. I took a few photos, and filmed a few videos - but not many. I was content to simply enjoy the day. Tomorrow was to be a different story; a pretty long travel day to Big Crow, so this day was a wonderful, lazy piece of paradise before I once again set out to a new destination. 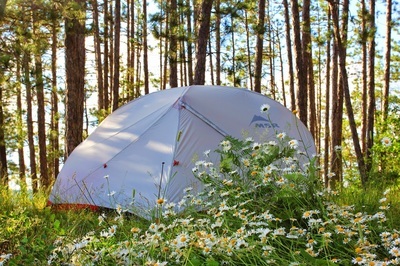 Not to ruin the surprise, but I have a particular bad habit on many of my camping trips. When a route starts nearing its end and I feel like I'm on the 'back to the car' leg, I sometimes ignore things like route planning, time and distance. What I'm saying is sometimes I just forget about the last night's campsite and keep paddling, seeing if I can make the car and surprise my wife by coming home a day early. I try to counteract this by making the last two days of any trip reasonably long, in the hopes I'll be tired enough to stop where I'm supposed to stop. This... has mixed success. This day, that 'second last day' trip was Catfish to Big Crow, which was about a 23 kilometer trip, including 7.5 kms of portages. From Big Crow to the Opeongo parking lot was a further 27.5 kilometers. Surely that was farther than I was going to travel in one day. I set off early, and the distance was eaten up quickly. The multiple portages into Hogan's came and went without incident. The paddle across Hogan was picturesque - a more gorgeous day you could not ask for. But the 3750m portage into Big Crow was coming up. I'd done that portage before, more than once, and didn't remember it fondly. 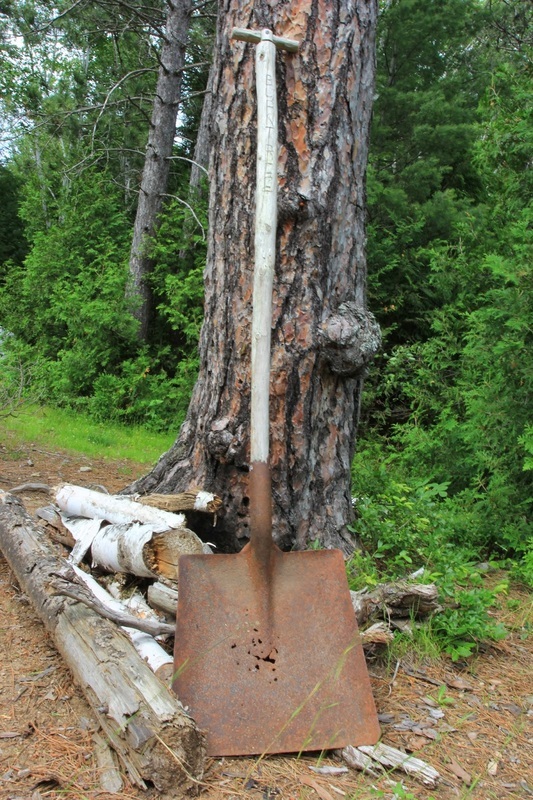 I decided to pull up on a little dot of an island, in sight of the portage foot, to rest and recharge before going on. For the last time on this trip, I shot a quick video. And that.. was that. I portaged the 3750 in Big Crow. As is also common near the end of my trips, I had a few minor mishaps: a slip here, a missed footing there. But I came out to Big Crow intact, and still with gas in the tank. Big Crow was very calm, something I'd seen little of on this trip. But this wasn't a bonus - it was only the wind that had been keeping the bugs, bad for this that time of year, somewhat at bay. 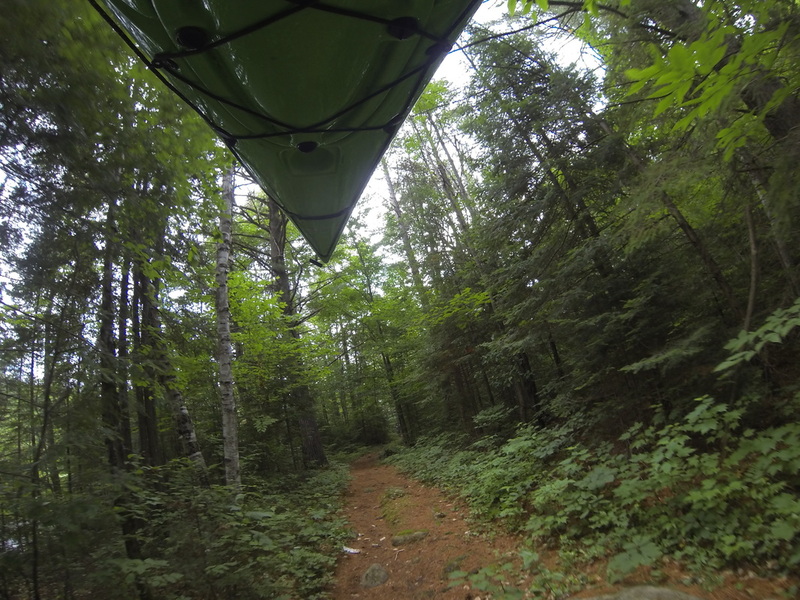 At that moment I decided what had been in the back of my mind all day: Opeongo or bust. While there was a long way yet to go it was almost all paddling, and kayaks eat up distance on the water. Big Crow was a quick crossing. The Crow River, as most rivers do, felt like it took longer than it should have. Proulx I flew across in short order. 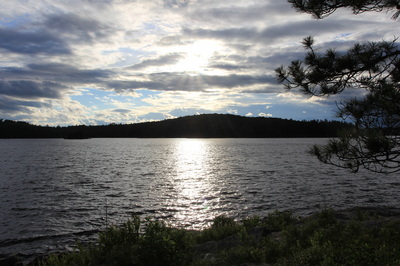 The portage between Proulx and Opeongo is well travelled, and I'd been on it many times. Before I knew it, I was on Opeongo. 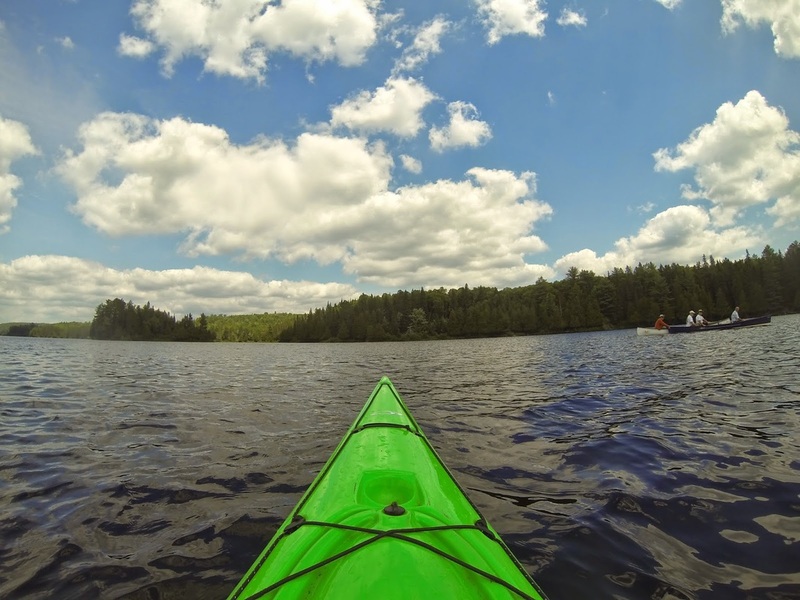 Only a short paddle across the biggest lake in all of Algonquin, and I was at the car! 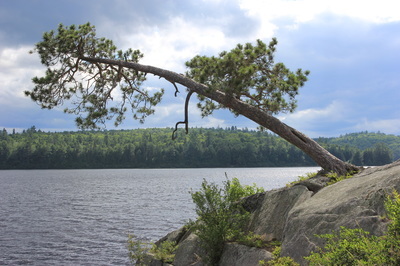 Opeongo always feels like a long paddle, and today was worse than usual. It's a big lake. Wind can be a factor. More of a factor though, is that it's on the Highway 60 corridor, and motor boats are allowed. There's nothing more disheartening than to see the water taxi fly into view, and then pass out of sight behind you, in the length of time it takes to cover 100 meters. But, head down and determined, I kept paddling. ​When the Opeongo store came into sight, it was like spotting an Oasis in the desert. And much like an oasis, I wondered if it weren't a mirage. But I pulled up, and packed up, and as always when I start home after days on the water, the sensation of speed in a car feels new and novel once again. And music on the radio, and the clean clothes I put on that were waiting for me in the car. I was exhausted. I had a long drive ahead of me to get home. 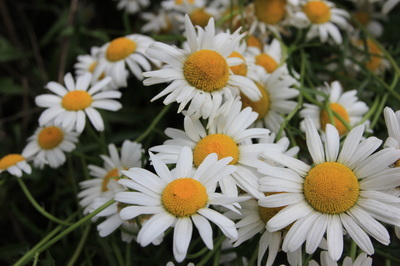 But I was immensely relaxed, and happy, and at peace with the world. I had one eye on the road, one eye on my cell phone signal, waiting until I could call my wife to tell her I'd see her soon.